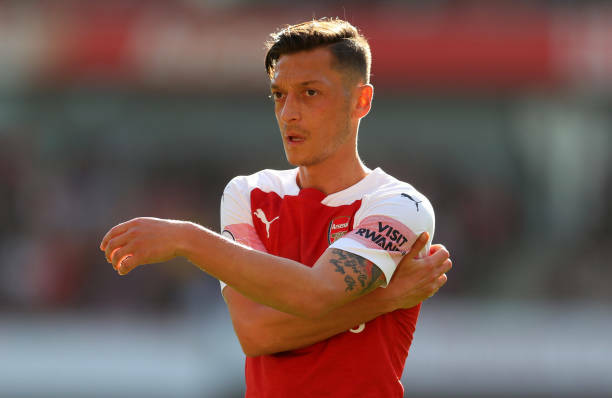 Arsenal boss Unai Emery has revealed why he took Mesut Ozil off during the weekend clash with Wolves. The Gunners were held to a 1-1 draw at the Emirates Stadium leaving them fifth in the Premier League table with 24 points after 12 games. Emery made a big call in the second half by replacing both Alex Iwobi and Mesut Ozil. Henrikh Mkhitaryan and Aaron Ramsey came on in the duo’s place and combined for the Armenia international’s goal late in the second half. Arsenal are now unbeaten in 16 games and will be hoping to extend their run when they take on Bournemouth after the international break. Following Sunday’s 1-1 draw, Arsenal boss Unai Emery admitted that his side were fortunate not to lose and explained why he withdrew Ozil. “I decided that we had two players on the bench like Mkhitaryan and Aaron Ramsey, attacking players. I wanted two attacking midfielders, so I made the change for this reason,” Emery told reporters after the game. Ozil has been in impressive form of late and has four goals and one assist in 12 games for Arsenal this season. The 30-year-old has over two-years remaining on his contract with the Gunners. Ozil will remain in north London over the international break after quitting the Germany national team.